The Suzuki Baleno 1.0 Boosterjet has been crowned Real MPG champion of 2017. The Suzuki hatchback proved to be the best for real world fuel economy, over the past 12 months, averaging 99 per cent of its advertised MPG. 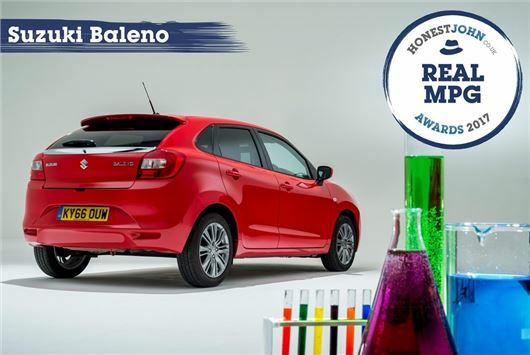 “When it comes to real world fuel economy, few cars can match the outstanding Real MPG of the Suzuki Baleno 1.0 BoosterJet," said Dan Powell, Managing Editor of HonestJohn.co.uk. I don't own a Baleno but I do think that Suzuki are leading the pack when it comes to RealMPG. Last week, I drove my Suzuki Celerio SZ4 up North and back. I covered 546.2 miles on exactly 32 litres of Tesco Unleaded. That's an amazing 76.85 mpg!! Yes, I accept that it was primarily motorway driving at a sedate 55 mph but on the other hand, the car had me & the wife in it and was fully loaded with the usual stuff you have to cart around when visiting The Rellies. In truth, I'm a bit narked that the mileage wasn't a bit higher on account of 20 minutes worth of semi-stationary traffic jams on the A6. At one stage the trip computer was predicting a range of 600 miles!